What a great turnout for our first meeting of the year, thank you to all who attended during what I know can be a very busy time of year. 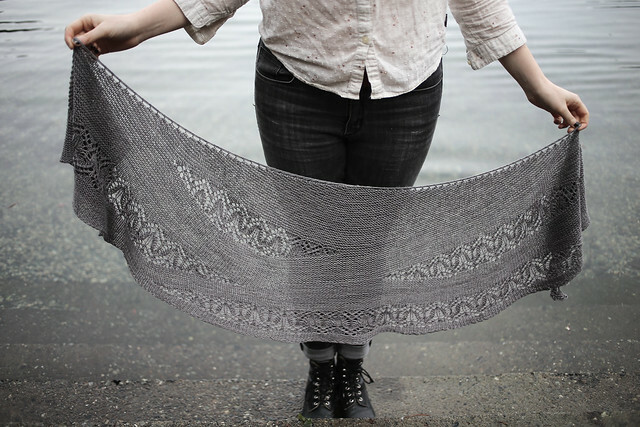 If you missed the Yarn Club meeting, let me catch you up on a fairly big change before I share some great resources from our talk. This coming Yarn Club year, Alexis will be taking time off to spend with her family and her newest addition, a baby boy due in October. She isn’t going anywhere, and will still come to meetings when she can, but our monthly meetings, blog updates, and general administration will be handled by two new faces this year. I am a friend of Alexis and a Yarn Club member since the beginning, and I am absolutely tickled to be keeping Yarn Club going while our fearless leader takes a break. Joining me is my fellow Yarn Club member and very dear friend Catherine. Together we will host Yarn Club meetings and keep you in the loop in the fibre community this year. You can reach us with any Yarn Club questions or comments through email at GuelphYarnClub AT gmail DOT com. We look forward to getting to know you all better this year. 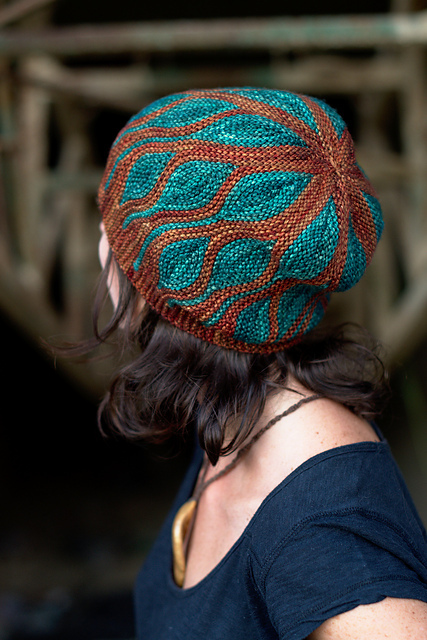 This month, we delved into an introduction to short rows. I was very open about my lack of expertise with short rows; I did a lot of research and swatching to prepare the talk this month, and the resources I used were a great help to me in creating the presentation, and hopefully in my future knitting. Once we covered some familiar ground with the common short row methods, we moved right into applications in our knitting. I saved garment shaping for the end, and expanded on short row methods with a study in sock heeling shaping. I adore knitting socks. They’re such a portable project, they can be plain Jane or complicated, and they’re a fun place to experiment with new stitches or techniques. I’ll be upfront and honest here, I haven’t done a lot of different sock heels. I’m kind of a wrap and turn fan, as this was the first short row technique I learned, and it hasn’t steered me wrong yet. It was eye opening and really interesting to try new heel techniques, and I encourage you all to follow in my footsteps and make a series of itsy bitsy heel swatches for the sake of your knitting education. The first set of swatches I created came from Nancy Bush’s Knitting Vintage Socks: New Twists on Classic Patterns. This is a great book to add to your library if you’re interested in vintage patterns that are adapted for modern yarn and knitters. I tested out the Dutch/horseshoe heel, the Welsh heel, and the French/round heel. Each one used a different short row method, and had a distinct look. All three use a heel flap construction on a top-down sock. I also looked at heels turned using short rows only, no heel flap. These could be added to a toe-up or top-down sock. The five short row methods I tested out were wrap and turn, yarn over, German/double stitch, Japanese/pinned, and the shadow wrapped method. 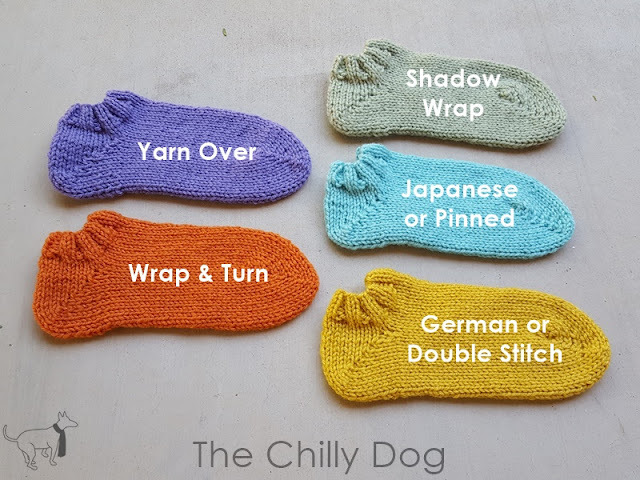 I tried these methods out on swatches, and the instructions for these all came from a very help website, The Chilly Dog, which detailed each method with lots of pictures and step by step instructions. Garment shaping is another great application of short rows. We scratched the surface by discussing shoulder shaping and adding bust darts to a garment. And the most helpful blog I came across was Knitting Bust Darts by Connie Hester. Highly, HIGHLY recommend. Great pictures, great examples, a solid discussion on short row shaping. This article walks you through how to add shaping to your next garment. As an added bonus, I threw in a quick few slides about adding vertical darts to your knitting in place of short row shaping. The link to Connie Hester’s blog details these instructions with examples as well. And while we didn’t get into discussing short rows as design features or unique construction elements, I finished things off with some examples of short row projects to inspire you. Catherine wrapped things up for the night with a hands-on mini workshop about entrelac. 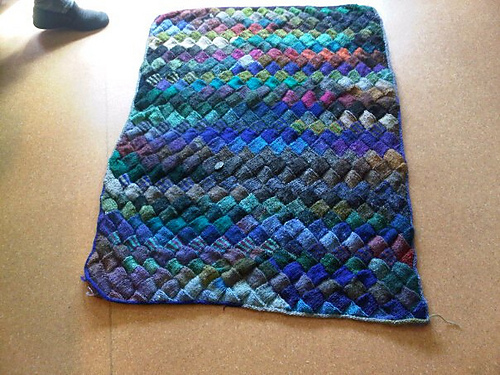 Her beautiful entrelac blanket took 3 years to finish and was modified from a scarf pattern. And for the crocheters, you’re in for a treat. 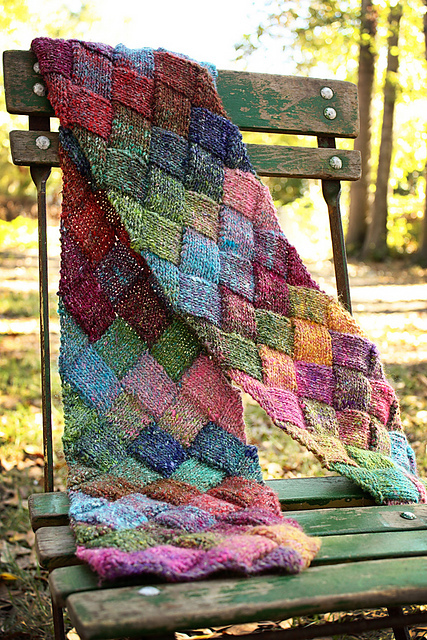 Catherine’s first love is crochet and here’s a curated search of patterns for crochet entrelac. This entry was posted in inspiration, knitting, yarn club. Bookmark the permalink. Follow any comments here with the RSS feed for this post. Post a comment or leave a trackback: Trackback URL.